Approximately 70 individuals attended the SRO hearing on a bill to add consumer protections to the co-op board application process. A City Council measure intended to provide consumer protection to co-op buyers was alternately praised and vilified at hearing of the Committee on Housing and Buildings across the street from City Hall on Tuesday. More than two dozen witnesses testified. A handful of shareholders and representatives of the brokerage community who spoke focused on deadlines and transparent purchase requirements in the bill, Intro 188. Opposing the legislation were real estate lawyers and co-op boards, which denounced its provisions aimed at unlawful discrimination against applicants and at speeding up board responses. The provisions of Intro 188 requiring co-op boards to provide a clearly defined list of purchase requirements and a timeline for board response to an applicant’s submitted purchase package are fair, reasonable and highly worthwhile. . . They will save time and stress by bringing certainty, transparency and timeliness to all co-op sales and move the process forward at a pace that is reasonable. Opponents savaged the bill, using the words “chaos,” “havoc” and “onerous.” They said that it benefited mainly the broker community and would cause a vast number of board vacancies. What this bill does do is assume that the boards and owners, who elect the boards, are somehow involved in a scheme to discriminate. . .
[T]he City council is going to create more paperwork and more of an opportunity for lawyers to sue co-ops for missing deadlines and failing to act the right way. . . Violations can be issued between $250 and $2,000 for the first instance of non-compliance, between $500 and $5,000 for the second, between $2,000 and $15,000 for the third. The financial penalties were particularly irksome to the bill’s opponents. They cited court decisions approximately eight years ago in which the president of a board found guilty of racial discrimination was fined $250,000, other members were fined $25,000 each and they had to pay the fines personally. At the outset, Councilman Lewis Fidler acknowledged that the bill he has sponsored “is not perfect” and that certain unspecified technical issues had to be resolved. At the same time, he insisted, to the vocal approbation of many attending the proceedings, that boards frequently reject applicants without owning up to their unlawful reasons. “I know it happens,” he declared, saying he was aware of buildings that will admit only members of their nationality and those who will reject the same nationality. When committee Chair Erik Mark Dilan pressed Liebman and Peters whether they categorically knew of any cases of disrimination, they conceded that they could not “definitely” report any. Yet another witness, Barbara Ford, representing the New York State Association of Realtors, detailed what she described as four examples of discrimination against buyers she had represented in the outer boroughs and on Long Island. “It happens all the time,” she related. One example was of a board that explicitly wanted to reject a prospective buyer because of her race. Told that she would resign as the building’s property manager if they took that unlawful action, the board relented. That, said Fidler, was the “best point” of the day. He made the statement in the face of criticism that buyers who face discrimination already have city, state and federal agencies to which they can complain and find redress. If so, he asked, why does the city’s Commission on Human Rights have only 22 such complaints on file? “Twenty-two! That’s a sin,” remarked John Doyle, senior vice president of REBNY. Barbara Ford said she had unsuccessfully urged her clients to go to the U.S. Department of Housing and Urban Development, which hears complaints about violations of the Fair Housing Act. One problem is that it is not the seller who is accused of discrimination; it is the board, a third party not covered by any anti-discrimination laws. “They can come up with any cockamamie reason they want,” she said of boards who want to mask discriminatory actions. 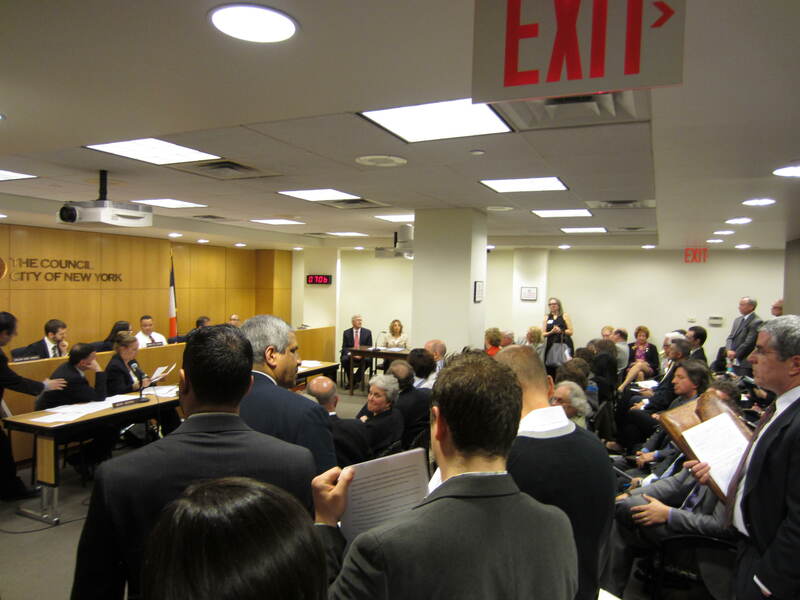 Among Council members who attended the hearing was Mark Weprin, who expressed doubt about the need for the discrimination component of the bill, and Brad Lander, who said it didn’t go far enough. Lander is sponsor of Intro 126, which requires boards to give a reason for any rejection. To the contention of those who argued that the timeframes would unduly burden buildings both large and small, especially those without property managers, Fidler implied that the bill would need to be fine-tuned to permit a range of standards. As for deadlines, Warburg’s Peters got a smattering of applause from, it seemed, shareholders, when he said that “everyone benefits from those timeline considerations.” The current “lengthy, lengthy process,” Peters added, always is an economic disaster to someone. But Saft and others maintained that rather than risk failure to meet the deadlines, boards may well just reject applicants who might have been accepted with enough time for additional research. “The last thing they want to do is let a sale fall through for no good reason at all,” Saft said. Aside from other lawyers — for example, Andrew Brucker, whose firm is general counsel to 200 co-ops and condos, and Geoffrey Mazel, whose firm represents Coop Board and its more than 9,000 units of housing — testimony also was given by the Council of New York Cooperatives and Condominiums, Federation of New York Housing Cooperatives and Condominiums, and the Alliance of Condo & Co-op Owners. The hearing lasted for close to four hours. To take your own bite out of the Big Apple, you have the option here to search all available properties privately.